Gaming with a chaser at a new arcade/bar in Spokane, Gamers. He loves shooting aliens and watching their bodies explode. "Don't come to our planet, assholes!" Nick Cavasier yells at the Area 51 arcade game, pointing his orange plastic gun at his onscreen enemies. Arcade games bring Cavasier back to a simpler time; back when he and his six brothers would play at a pizza joint late into the evening. This alien game was a particular favorite, where two people could play against the world. It was a way to get out their aggression. 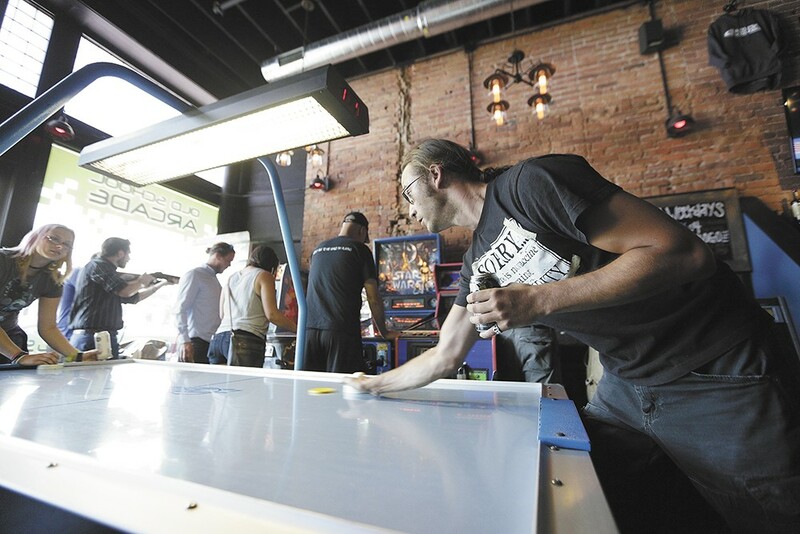 Now with the help of the newly opened Gamers Arcade Bar, Cavasier and others can get back to working toward those high game scores, but this time with a can of beer or gourmet hot dog in hand and no kids to contend with. While independent arcade bars have started popping up around the country over the past decade, this is the first of its kind in Spokane. Today, just before the bar's grand opening next to the Spokane Comedy Club and the new Pinot's Palette spot on Sprague, Cavasier, a 25-year-old local comedian, shows off some of his favorite games. He prefers the Wolverine avatar on X-Men: Children of the Atom and explains that the fighting game Tekken 2 is notable for its 3-D views. When "game over" flashes across the screen, he says it brings back fond memories. "I'm not that great at any of these games," Cavasier says. "The reality is, with the majority of these you're going to lose. But it's about how far you can go next time you play. That's why you come back." Gamers features a mix of old-school games. To keep the party going opening weekend, co-owner Adam Norwest has spent the whole week rounding up quarters. "There are no quarters left at any of the banks in Spokane," says Norwest, showing off a 25-pound box of quarters totaling $500. "I've wiped them out." These will help patrons play of any one of the bar's 22 games — everything from Ms. Pac-Man and Centipede to a boxing game and Star Wars pinball — at 25 to 50 cents per try. 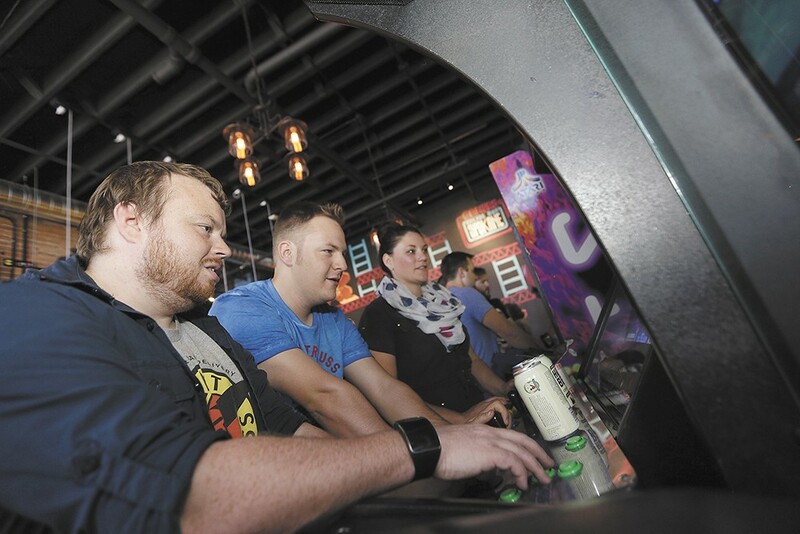 Norwest says he fell in love with the arcade bar concept as a frequent flyer at Dorky's Bar Arcade in Tacoma, near his family's Tacoma Comedy Club. The plan was to wait a year, after the Spokane Comedy Club opened in March, to try their hand at the bar business. But success came early. "Spokane has been so good to us," he says. When the 1,000-square foot space came open three months ago, they jumped at the chance, renovating the spot and adding a Donkey Kong-themed mural. Norwest says that nostalgia for 1980s and '90s games is definitely a factor in the popularity of these types of establishments; it's yet another way for Millennials and Gen X-ers to commune while having what Norwest calls easy, mindless fun. Soon, he plans to host air hockey tournaments and more. New arcade games and pinball machines are still made in America — think Big Buck Hunter II and Golden Tee Golf — but few people know how to repair them. That's where Shawn McKay, who's been working with arcade games for 50 years and owns Bullseye Amusements, offers his services. His shop outfitted the entirety of Gamers Arcade Bar, along with renting to many bars, bowling alleys and arcade stops throughout the Inland Northwest. Starting out, Norwest came to McKay with an wish list of old and new arcade games, most of which McKay had on hand in his massive Spokane warehouse. What he didn't have, he looked for on Craigslist and eBay. "All over I'm getting calls for retro machines," says McKay. "Luckily, I didn't junk 'em back when everyone was doing that, and decided to save them. I'm kind of a game nut." With the rise of the home gaming console and internet, paired with the decline of American malls, many arcade centers were forced to close in the past two decades. McKay says that this bar arcade idea is still a niche operation. "I think it's not that big of a trend," McKay explains. "There's only a couple arcade bars in Seattle and other big cities. It's not a giant thing. It's not like Golden Tee Golf that everyone wants in a bar. Not everyone wants a retro Pac-Man." But along with the recent opening of Jedi Alliance, an all-ages local game room, there's currently a local interest in keeping arcade games alive. Cavasier says he can't wait for more folks to be exposed to these games, especially those who thought they were only for nerds. He suggests that newbies should try out all of the games, as you never know what you'll excel at.